Comedian Paul Hogan was already familiar to audiences outside of Australia when his sketch series The Paul Hogan Show (1973-1984) was syndicated across the globe. He was also the face of popular Australian Tourism advertisements, imploring people to throw a shrimp on the barbie. 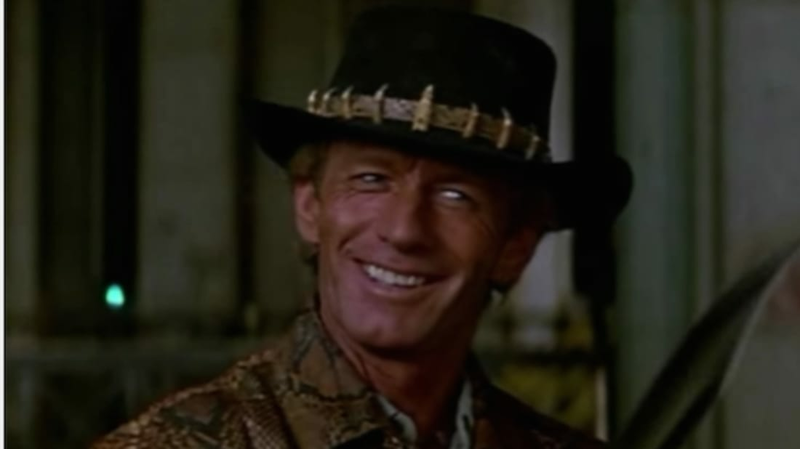 It was still a shock to most when Crocodile Dundee became the highest grossing movie in Australian history, and with the exception of Top Gun, the highest grossing movie in America in 1986. The New York Times called it the "movie phenomenon of the year," describing it as a "sort of sweet-tempered, common-sensical Rambo." 1. IT WAS LIKELY INSPIRED BY ROD ANSELL. While on a fishing trip in 1977, Rod Ansell's boat capsized, thanks to a crocodile. He spent a night drifting out to sea before finding himself on an island off the shore of the Fitzmaurice River in Australia's Northern Territory. He spent seven weeks surviving on his wits, including drinking cow blood, before he was rescued. He was interviewed about his adventures on the popular Michael Parkinson talk show, where he allegedly talked about preferring to sleep on the floor of the hotel the Parkinson crew kindly put him up in. Ansell claims Hogan cited the Parkinson interview as the inspiration for the movie in an early radio interview, but a transcript of the interview was never found. Ansell's life ended in 1999 after a shootout with police officers. In 2000, Hogan said the belief that there is one real Crocodile Dundee is a "myth." 2. INXS LEAD SINGER MICHAEL HUTCHENCE WAS ONE OF THE FILM'S INVESTORS. Among the 1400 investors responsible were brokers, wealthy cricketers, and Michael Hutchence, the lead singer of INXS. The Queensland investment bank of Paul Morgan & Company underwrote the $7.1 million needed to make it. Hogan and Cornell added $600,000 of their own money. The film ultimately made over $300 million worldwide, and the profits were split amongst the investors. 3. YOU COULDN'T CALL THOSE REAL BOWIE KNIVES. Steel, rubber, and aluminum versions of Crocodile Dundee's Bowie knife were on the set. Prop designer John Bowring was asked by Hogan himself to make a stainless steel version, even though it wasn't in the script. When Bowring asked Hogan where he needed a steel knife in the movie, Hogan explained he hadn't written that part yet. 4. ONE OF THE WRITERS DIDN'T THINK THE "KNIFE" LINE WAS VERY FUNNY. "It wasn't funny on paper," Shadie admitted about the line "That's not a knife." The quote was a collaboration between the three writers, and it became one of the movie's most memorable scenes. 5. THEY SHOT ON LOCATION IN AUSTRALIA AND NEW YORK. Among the Australian locations was Kakadu National Park, which is about the size of Germany. It gained so much notoriety that the park offered "Crocodile" Dundee tours after the movie came out. Vazak's Bar in the East Village was also in The Godfather Part II (1974) and Rent (2005). The New York hotel room is a $900 suite at the New York Plaza Hotel. It was the hotel in North by Northwest (1959) and Home Alone 2: Lost in New York (1992). 6. HOGAN WORKED ON THE BRIDGE THAT SUE LOOKS AT IN THE BEGINNING. The Sydney Harbour Bridge is shown from the hotel window while Sue is on the phone to New York. Hogan was a rigger on it, not a painter like it was usually reported. ''Look, if I had been a painter—and you'd turn up every day and say, 'What color are we going to do today boys?' 'Ah, Battleship Grey'—I'd have jumped off," Hogan said. 7. THE CAST AND CREW SLEPT IN HUTS. Since there were no suitable hotels near where the cast and crew shot in Kakadu National Park, they resorted to briefly living in dilapidated huts. An armed guard was always there to make sure a real crocodile didn't cause problems. John Cornell also made sure there was beer around so the crew enjoyed themselves. 8. THE CROCODILE WASN'T REAL. When Sue (Linda Kozlowski) was attacked by a crocodile, she was never in danger, and not just because Mick was following her—it was actually a mechanical croc that cost $45,000. Hogan had wanted a real one for close-ups, but it wasn't feasible. 9. THE BUFFALO WAS REAL (AND VERY STUBBORN). When Hogan was asked what the hardest animal to work with was by IGN in 2001, he didn't hesitate. "Buffalo. Cause if the buffalo doesn't want to do anything, it weighs 2000 pounds and you know, it doesn't. So you have to hang around [and wait for it to be cooperative]. The Asian Buffalo in Australia with the 8 feet of horns. [That scene in the first film took] all day. It's like he said, 'I'll just sit here. And you can't do anything about it.'" 10. THE MOVIE PLAYING IN THE HOTEL ROOM IS FITTING. In a bit of name symmetry, the movie playing was the Sam Peckinpah feature Major Dundee (1965), starring Charlton Heston. 11. 20TH CENTURY FOX (RUDELY) SAID "NO" TO ACQUIRING THE AMERICAN RIGHTS. John Cornell showed the movie to a 20th Century Fox executive while he was in Hollywood trying to sell it. ''There was some idiot who sat with his feet on the desk and watched it for about 20 minutes, looked at this watch about eight times and told me that it wouldn't work,'' Cornell remembered. ''He was extremely rude. I sometimes get pleasure from thinking about what the look is like on his face at a time like this.'' Paramount ended up acquiring the rights. 12. THE AUSTRALIAN AND INTERNATIONAL VERSIONS ARE DIFFERENT. After test screenings revealed that audiences got restless at some of the Australian slang, some of those terms were dubbed into American speak, or just taken out altogether. In all, seven minutes were deleted from the movie for the international version, almost all from the first half where the action is in Australia. "We accelerated the pace to the taste of the American consumer,'' Barry London, the president of distribution at Paramount, admitted. 13. THE QUOTATION MARKS AROUND "CROCODILE" IN THE TITLE WERE ALSO ADDED FOR THE AMERICAN AUDIENCE. 14. PEOPLE LOOKED FOR THE BIDETS AT THE PLAZA HOTEL. Tourists specifically asked for Mick Dundee's room and made phone calls to the Plaza Hotel asking for rooms with bidets. The Hotel, however, didn't have rooms with bidets, and the one in the film was on a set built by the movie crew. 15. HOGAN AND KOZLOWSKI GOT MARRIED IN REAL LIFE. They wed in 1990 and had a son, Chance. Kozlowski filed for divorce in 2013.